It is no secret that Pioneer Millworks supplies flooring for many retailers, In fact, we have providing flooring, shelving, timbers, barn siding, and all sorts of other woodwork for many of the biggest names in specialty & high-end retail. See, we’re accustomed to the slick, clean nature of most mall stores – plenty of tile, glossy finishes, big bold colors, and a very fake and almost plastic-like look. Retail stores are usually repeated so that each location looks the same as well – if you go into the mall here in Rochester, NY, the average womens’ clothing store will look just like one anywhere else in the country. But if you’ve never been into a store like Anthropologie, for example, it is quite different than any other retail experience. Wood, plaster, tile, stone, and other varied materials are used in abundance, creating an effective, yet subtle, backdrop to the clothing and merchandise. We always have plenty of cool wood around, which is more limited in nature than our standard product line. This works perfectly for retailers who like to shake things up a bit and differentiate each store. Throw in some wood for a textural variation here, or maybe an area of wood flooring there, and you can bring some “green” into your store, and bump the appeal of shopping there. Tout to your customers that you’re using a recycled product, and it adds another whole level of coolness, and awareness. 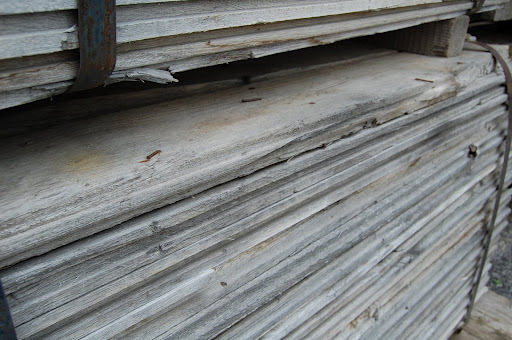 This isn’t something you see on our website, and while we could cut it up for flooring, this would be an awesome material for tables, retail fixtures, or even a historical restoration. So next time you need something unique & interesting – call us at 800-951-9663, e-mail us or drop by the shop. There’s ALWAYS something cool to see.